If you're looking for a complete system info app for Android, give this one a whirl. 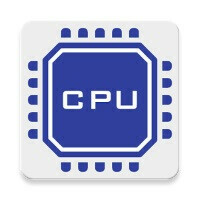 CPU Hardware and System Info is quick and to the point, both in name and practice. It's organized in 13 tabs that give you relevant information about your device, such as name, model, manufacturer, board, bootloader, kernel architecture, and vice versa. A dynamic data panel outlines your chipset with data on CPU Min/Max frequency, clock speed, CPU temperature, cores, CPU activity and thermals. Memory is detailed with internal/external memory status, RAM (total, used, free). Your display's screen size, resolution, density, refresh rate and still brightness are presented, and the next tab is occupied by your battery stats (health, level, power source, status, technology, temperature or voltage). The app also shows sensor values in real time, supported camera resolutions, phone info (Device ID, Type, Network Operator, Signal Strength, SIM Serial Number), network data (connection type, Wi-Fi signal strength, IP & MAC Address, SSID, connection speed), and enough bonus stuff to make listing it all tedious. CPU Hardware an System Info stores none of this data (not even in cache), so your privacy isn't of much concern. However, exporting the data as PDF is present as an option, along with a sharing feature so you can beam it to whoever it is that you want. Everything the app does happens in a clean and simple interface that has Google stamped all over it. The app is also free to use, although ad-supported. Seems like for the display size, it takes away the on-screen button area. What's wrong with scrollbars? Guess you'd rather sacrifice function for tiny tiny style that can actually be overlooked. It shouldn't be there if it's a short list, but it's a must if it's a long one. I specifically downloaded fast scroll xposed module to get that function. Castro and DevCheck have more info.